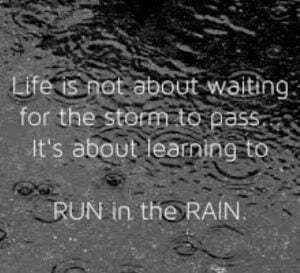 Learning To Run In The Rain? 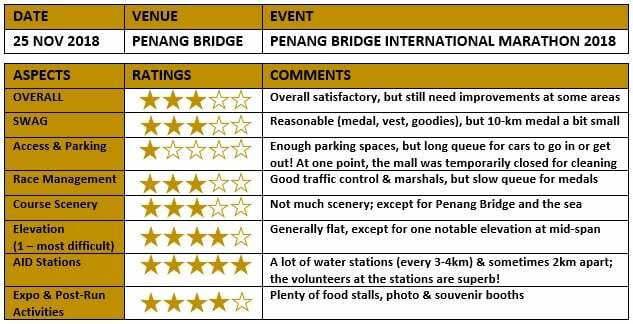 A review of Penang Bridge International Marathon 2018 by Paradigm Runner | JustRunLah! 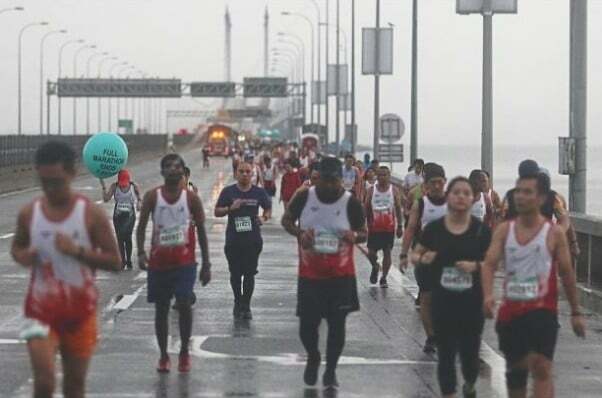 The heavy downpour during Penang Bridge International Marathon 2018 (PBIM18) has certainly raised a storm of angry protest among its runners. Rightly or wrongly, even keyboard commentators also rained down (pun intended) criticism on its organizer. What began as an almost-perfect flag-off of this international marathon has somehow exploded into a drama of various issues that has left runners disgruntled, PBIM18 organizer chided, run cancellation queried – and a pacer nearly struck by lightning! 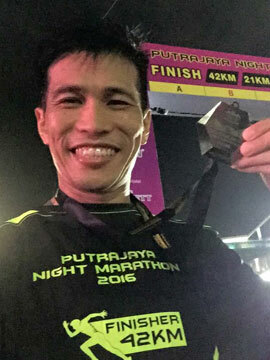 So much has been posted on the social media; ranging from the frustration of 10-km participants, the wrath of terrible weather, the inaccessible mall, to the long queuing time for parking and medals, the Chips’More-size 10-km medals, the late-comers who demanded their medals and many more. Consequently, accusations were thrown at PBIM18 organizers for their alleged incompetence and lack of contingency plans. The question was whether all the flak was thoroughly deserved or just a proverbial storm in PBIM18 teacup. TO CANCEL OR NOT TO CANCEL, THAT’S THE QUESTION! 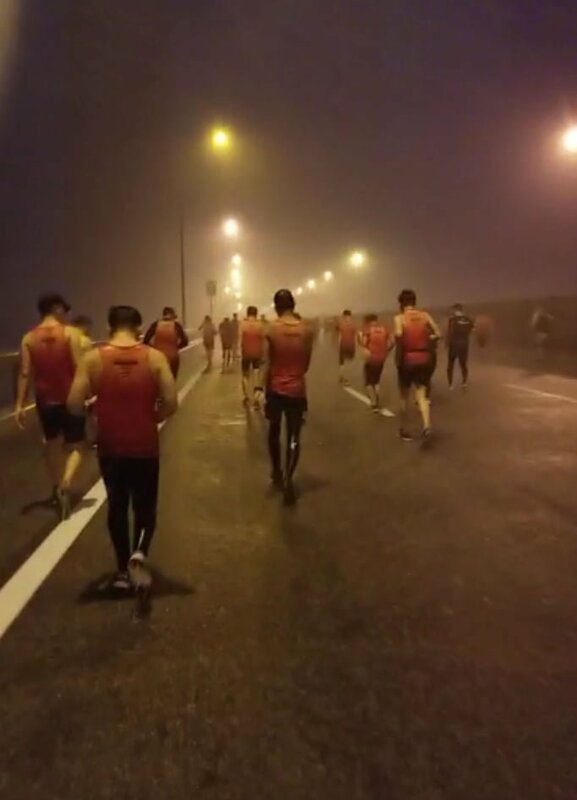 Post-PBIM18, some participants predictably vented their frustration and disappointment over the internet, chastising the wisdom of 10-km cancellation and citing the extent of training and expenses they had undertaken in preparation for the event. Before coming to a conclusion, let me share my experience of the storm! After the flag-off of FM (1.30am), ominous clouds soon gathered in the sky. The weather took a turn for the worse, when it began to rain around 4.30am. What took everybody by surprise was how fast the drizzle abruptly erupted into a squall – with flashes of lightning and claps of thunder. Abetted by the strong sideways wind, the heavy downpour incessantly assailed the marathoners left, right and centre. Every raindrop felt like a sting on the skin and at times, the participants ran into headwind. There was no shelter from the ‘assault’, especially for runners out in the open on the bridge, where they were completely at the mercy of the elements. Perhaps the thought of discontinuing did cross the mind of the marathoners. Frankly speaking, the option of stopping on the bridge amidst the thunderstorm was equally unattractive; hence my decision to press on! Despite what others may say, my personal view is that the bold decision to cancel 10km run should be applauded, instead of hammered! The overriding factor should be the runner’s safety. It would be much worse if the 10km run had continued and a few runners were injured during the tempest. A few also argued that the rain has already subsided around 630pm (10km flag-off time), but who could guarantee that the storm would not return with a fury? We certainly don’t need a repeat of runner’s accident! Perhaps we still recall the unfortunate demise of marathoner Evelyn Ang from Klang City International Marathon 2017 and the mishap of participants in Pahang Marathon 2018. 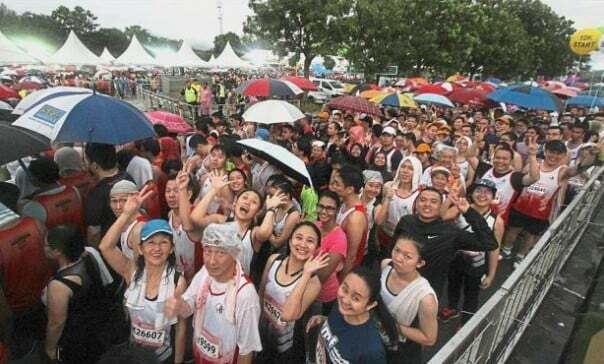 Some also asked why HM & FM runs were not called off during the downpour and comparisons were inevitably made to the recently-cancelled Putrajaya Night Marathon 2018 (also due to bad weather). Well….. perhaps this is something that PBIM18 organizer should come out to explain! In all honesty, I was expecting the run to be stopped; hence I could only half-guess the reason for their decision. A possible flow of thought was that most HM and FM runners should be either just approaching the bridge, or somewhere near the mid-span, when the thunderstorm struck. 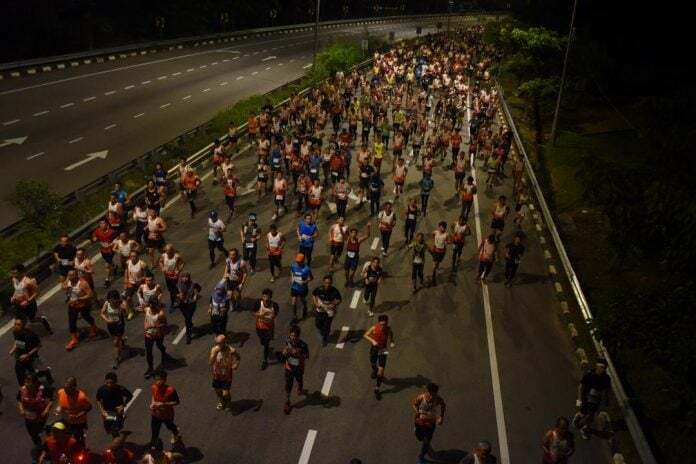 The million-ringgit question was if PBIM18 organizer abandoned the entire marathon, could they somehow promptly mobilize many sweeper buses to fetch thousands of unsheltered runners stranded on the bridge? Unless they readily worked out a contingency plan (eg dozens of buses already on standby), this could trigger a logistic nightmare and may even expose the runners to the additional risk of more vehicles plying the bridge during the storm. Remember that with hindsight, everything is always 20/20. The long queue for the medal seems to be a perennial problem of PBIM plaguing this run for several years. With this matter still fresh during PBIM17, it was a surprise that this issue still reared its ugly head this time. Was there any valid justification for the waiting game? Let’s examine what has happened! It should be anticipated that upon the 10-km-run cancellation, its participants would make a beeline for their medals. Unlike the gradual arrival of finishers, this time there would be a sudden bottleneck of 11,000-plus queuing runners. Given the task magnitude (unless somehow PBIM18 organizer can instantly have additional counters and helpers), it was understandable that there should be some waiting time for 10-km medals. However what truly puzzled us was the feedback that some exhausted FM runners also had to wait at least 20-30 minutes in the rain for theirs. Perhaps more helpers or stations may be needed in future. How about pre-packed goodies bags (medal, finisher tee, food etc)? And the collection lanes created based on T-shirt size (as conducted by other established marathons)? This would surely minimize the checking and shouting of T-shirt size and last-minute packing of goodies bags, which may cut down waiting time. 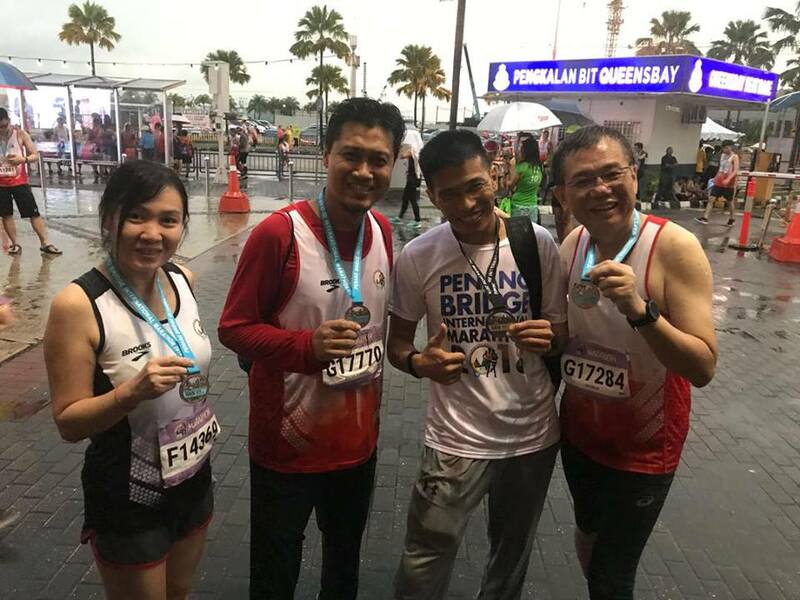 Perhaps PBIM organizer could learn from the experience of other run organizers – for example despite higher participation (38,000 runners), Dirigo Events (the organizer of Standard Chartered Kuala Lumpur Marathon) seemed to handle the medal distribution rather well. No congestion or complaint of long waiting time, with the medal collection process rather smooth flowing! One plus point about PBIM18 was the numerous water stations along the run route! These stations were about 3-4km apart, with a few perhaps about 2km away from the next one. A special mention must also be made about the volunteers and kids who were in charge of these water stations. Despite the tempest, they steadfastly remained at their assigned sites. As a marathoner myself, nothing dampened the spirit of runners, more than the sight of abandoned water stations. Not only did these volunteers distribute the much-needed food and drink in the rain, they also loudly encouraged the tired runners to persevere. Indeed their cheering voices sounded like music in the rain and helped to lighten the dire situation. Their enthusiasm has definitely won much admiration from everyone, especially the marathoners! On behalf of all runners, my utmost appreciation to these unsung heroes again – “kudos for your dedication and a job well done”! After all is said and done, so where does that leave us now? In my opinion, PBIM18 organizer surely has to improve on certain aspects of their event, but not all censure from their critics was warranted. In his PBIM18 message, YAB Chow Kon Yeow (Chief Minister of Penang) said that “I am confident that the new PBIM committee will continue PBIM’s reputable legacy and take the PBIM to greater heights”; hence the onus must fall on PBIM committee to do the right thing to scale that lofty altitude! In view of the mounting criticism from runners and public, it will be wise if PBIM18 organizer positively takes the feedback from public on various issues, critically analyze their processes, build on their strength and look for areas for improvement. If necessary, try to benchmark with other world-standard marathons, as well as consider whether to change the event date to avoid the raining season. Perhaps they should make a public announcement on their findings and how they intend to improve for PBIM19. Only then will they be able to restore public confidence and receive continuous support from the running community. “Keeping silent and hoping people will forget” should not be their modus operandi! BIO: Started running since my school days, I am an avid runner who believes that anyone can run and overcome their physical and mental boundary if they put their minds to it! I hope to inspire more people to start running through my blog! Click here for more post from Paradigm Runner.